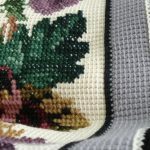 In what will hopefully be the first of many cross stitch background patterns I share, it seems only fitting that it is a pattern designed by Therese de Dillmont. Dillmont apparently worked with Jean Dollfus who was the director of Dollfus-Mieg and Company, better known today as DMC. Dollfus helped Dillmont start an embroidery school in France. 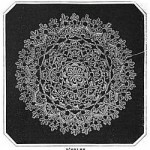 She wrote a number of books in cooperation with DMC and the book in which this pattern was found is one of those collaborations. 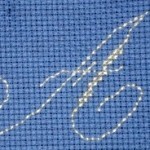 It is a relatively simple 2-color cross stitch background design that I found worked up fairly quickly. 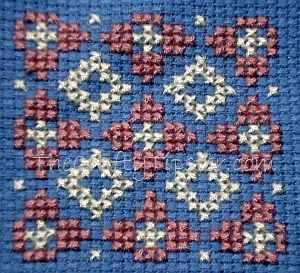 I’ll tell you that it was much easier to do the counting for the part of the cross stitch design completed in the pink yarn. I started out stitching in the creme color and found the counting a tad bit more challenging. When I switched, it came together fairly quickly. Of course, it could have just been that I was more familiar with the pattern by then.